Recovering from burns he received near the sun's surface, Donton gets an opportunity to shine when Genesis 7 ventures To Venus. After a brief detour to Earth to mend the craft and Donton's wounds, the eager lieutenant's aerocapture skills are put to the test when he is required to navigate "Little G," the Genesis 7 lander, to the surface of the desolate, terrestrial planet. Will Donton, Enoch, and Priscilla successfully complete the most challenging leg of their mission to date and collect the necessary samples to transport home to Genesis Command? 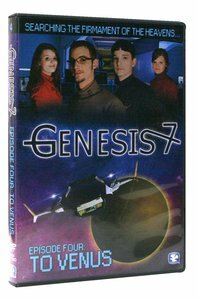 Funded by Christian scientists who want to prove that the universe was created by God, the Genesis 7 space program has launched a series of thrilling and perilous adventures the steadfast crew never could have predicted. Now, climb aboard with Captain Enoch Andrews, Lt. Donton Andrews, imaging specialist Priscilla Andrews, and Lt. Abigail Jennings as they strive to bring glory to God in everything they do. About "To Venus (25 Mins) (#04 in Genesis 7 Series)"